Tyson, who is currently 49, retired from professional boxing in 2006 after multiple knockouts. In 2009, Tyson’s daughter Exodus passed away from an accident caused by a treadmill cord. A little over a week after his daughter’s passing, he married longtime girlfriend, Lakiha Spicer. Mike Tyson has been doing many things since his retirement from professional boxing including becoming Vegan. Tyson turned Vegan in 2009. A time in his life when he was fragile. Mike Tyson was in rehab for drugs and alcohol. One day he said in an interview that he ate the smallest piece of meat, and he became really sick, throwing up and had extreme stomach pains. That moment he realized that meat was just poison to his body and mind. Mike Tyson turned vegan to become a healthier and clean man. In an interview, he spoke with talk show host Oprah Winfrey regarding his recent life changes. He said that he was congested from all the drugs and bad cocaine, Mike could barely breathe, he had high blood pressure; he almost died, and he had arthritis but when he became a Vegan all those health problems went away. Remember Tyson Bite off Holyfield’s ear? 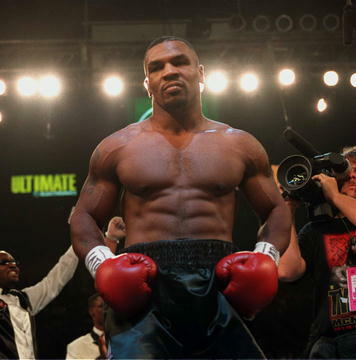 Tyson’s most historic moment was against Boxing legend, Evander Holyfield. Mike Tyson bit off Holyfield’s ear during a boxing match. Tyson would explain years later that the meat and drugs he had exposed to his body were the reason he was so crazy. His wife changed her eating habits on a regular basis and at the time she was eating Vegan, so Mike decided to follow along, and it could be the best decision he had made. Tyson, becoming a Vegan meant he had to exclude meat, eggs and dairy products. All food derived from animals. So, what did ‘Iron’ Mike Tyson eat to stay Vegan for four years? He has committed to working out every morning and sticking to his plant-based diet. Mike Tyson would get up every morning and do an hour of cardio. He would work on the Treadmill or the Treadclimber for an hour then go to the gym. Overall, Mike Tyson has lost 100 pounds of fat, gotten his body back to the healthy fit body he once had. Changed a lot of his past habits that was toxic to him. Tyson is no longer a Vegan, but he still has a healthy body.